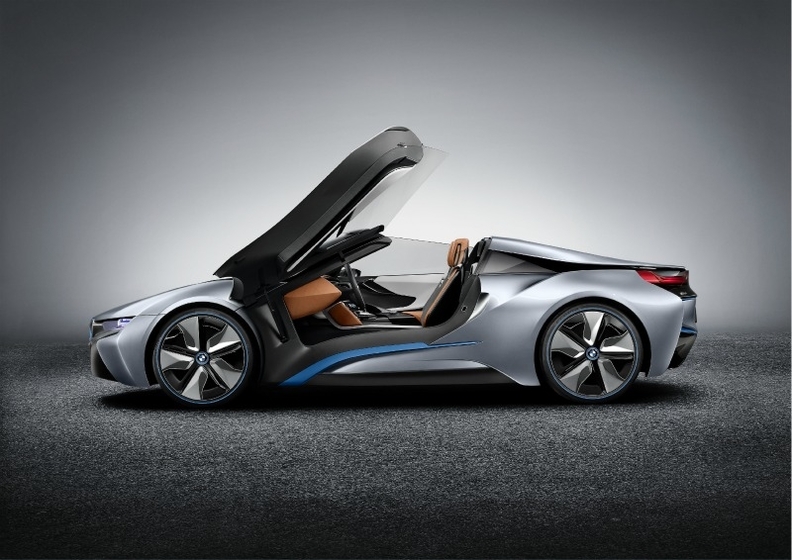 The i8 Spyder is the third concept car in BMW's i sub-brand lineup. FRANKFURT -- BMW revealed pictures of the i8 Spyder, the third concept car from its i sub-brand. 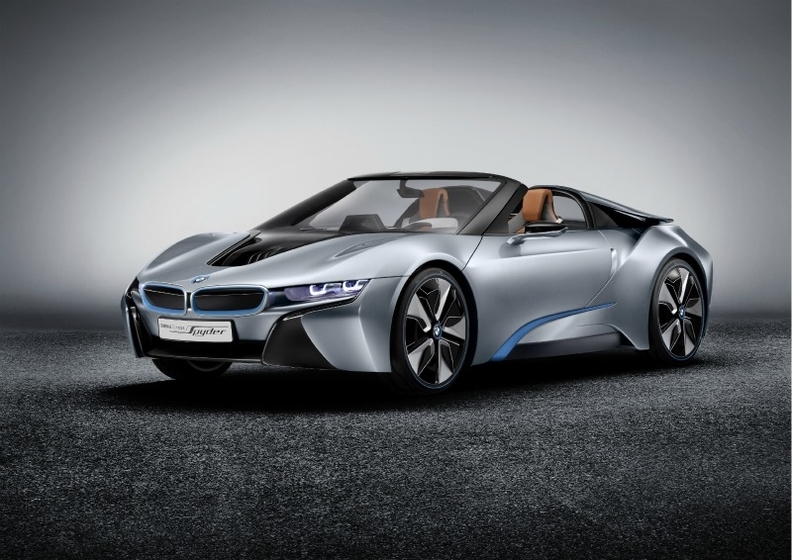 The i8 Spyder will debut at the Beijing auto show later this month, a BMW spokesman told Automotive News Europe. 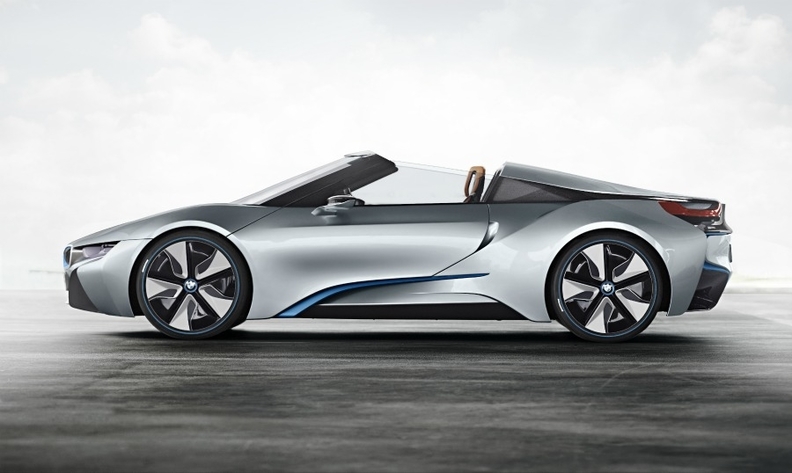 The concept is a roadster version of the BMW i8 plug-in hybrid sports car. 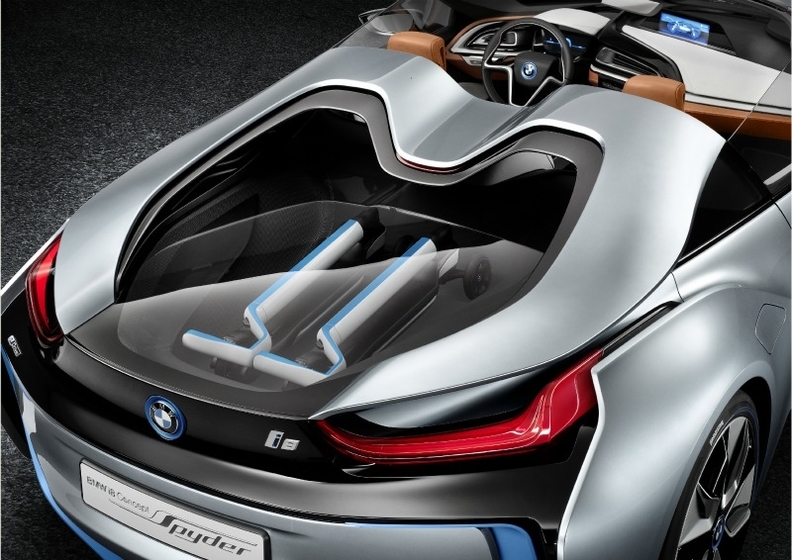 The i8 Spyder has windowless doors that swivel upwards to open. BMW will launch the i sub brand next year with the i3 electric small car. The i8 coupe will go on sale in 2014. BMW says its i3 and i8 concept cars give a clear indication of what the production-ready models will look like. The BMW spokesman told ANE, that prices for the models will be announced nearer the launch dates. The i8 Spyder has a wide but low body. Although closely modeled on the i8 coupe, with a lightweight carbon-fiber and aluminum modular construction based on BMW's LifeDrive architecture, the two-seater i8 Spyder concept has a shorter wheelbase and upward swiveling, windowless doors. The i8 Spyder also has additional on-board equipment including a pair of electric scooters, housed under a transparent tailgate. The i8 retains the sporty proportions of the coupe, with a wide but low body, that gives the car an overall aggressive stance. This sporty look is further enhanced by distinctive aerodynamic elements such as the spoiler lips and air inlets. The Spyder concept's equipment includes a pair of electric scooters, housed under a transparent tailgate. According to BMW, the i8 can travel 27 km to 30 km (17 to 19 miles) on battery power. It has fuel economy equivalent of about 3 liters per 100km (78 U.S. mpg; 93 UK mpg). The combination of a 131 hp electric motor to power the front axle and a 223 hp turbocharged three-cylinder gasoline engine to power the rear axle, give the car up 354 horsepower – enough to accelerate to 100 km/h (62 mph) in five seconds and reach an electronically governed top speed of 250 km/h (155 mph). The electric motor, which is powered by lithium ion batteries, can be fully charged via a domestic plug socket in under two hours, BMW says.